Commonly known as “The Land of Fire and Ice,” Iceland has an allure that has been drawing in travelers to experience its unique natural attractions, like glaciers, volcanoes, waterfalls, geysers, lagoons, and more. You can reach Iceland direct from the east coast in only about five hours. If you’re just passing through on your way elsewhere in Europe, it’s easy to extend your stay for a few days with an Iceland stopover. Everything in Iceland is very expensive, so be considerate of that when planning the duration of your visit. We stayed at this cute little Airbnb in Reykjavik about a 5-minute drive from the main part of town. 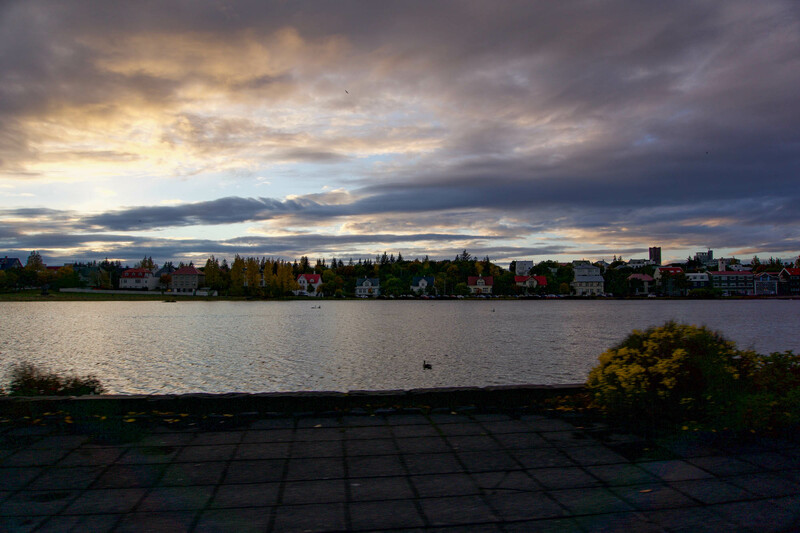 Since you’ll likely be renting a car for your visit, it’s worth looking a bit farther out from central Reykjavik to save money. That same place is no longer available to rent, but there are plenty of similar Airbnb options available. Sign up for Airbnb with this link and new users will receive $40 off your first stay! Iceland is one of the safest countries in the world, with extremely low crime rates and one of the best rated countries for quality of life, health care, gender equality, and education. This guide shares some suggestions of what to do on an Iceland stopover, complete with two road trips and a soothing visit to the Blue Lagoon. I suggest Blue Car Rental for your rental car, which is the company I used for this trip. Use code #BLUELTT to get 5% off. They are reliable, transparent, and even give you a rules of the road guidebook which is handy to review before driving and keep with you in the car. I also recommend opting in to all of their insurance options to be on the safe side. When in Iceland, be on the lookout for the Northern Lights! If the weather is in your favor, you can typically see them from late August to mid-April. To increase your chances of seeing the Northern Lights, visit between late September and late March. We were lucky enough to catch them in Reykjavik, and they were nothing short of amazing. We watched them from Grótta Lighthouse, a poorly lit area that looks out over the ocean, making for an ideal Northern Lights viewing point. This area is gorgeous at dusk, so it’s worth getting there a little early to enjoy the sunset. To get there, enter these coordinates into your navigation: 64.164502, -22.021556. Have patience and dress warm. We had turned around to head back to the car thinking the night was going to be too cloudy, and when I looked back for one last time the sky was illuminated with ribbons of light. The sky started moving and colors filled the darkness like I’ve never seen before! When you’re looking for a bite to eat, make your way to Íslenski Barinn (Icelandic Bar) for interesting Icelandic fare and a beer. It’s in a good walkable area of town where you can explore other shops, bars, and restaurants throughout the day at your leisure. Although Iceland’s Golden Circle is one of the most well-known drives in the country, there is good reason it’s so popular! You could spend hours at the first stop alone, Thingvellir National Park, where there are loads of designated trails waiting to be explored. The many cracks, or faults, on the surface in the park signify the continental drift between the North American and Eurasian Plates. Some of these rifts are full of clear, icy glacier water. It is truly a unique experience as Iceland is the only place in the world where this rift occurs above sea level. You’ll know you made it to your next stop, the geysers at Haukadalur, when the smell of sulphur hits your nose. There are all kinds of hot, bubbling pools everywhere you look, giving off a steam that lingers along the ground. One of them, Strokkur, shoots 482 °F (250 °C) water up 100 feet into the air for an impressive performance every 5-10 minutes. Speaking of natural wonders, Gullfoss and Kerið Crater are two other must-sees on this route. In between these two you can stop for lunch at Friðheimar, an entire greenhouse that uses the area’s geothermal energy to operate year round. Once you sit down, you can enjoy a steaming bowl of tomato soup right next to the tomato plants. Each table also has its own basil plant so you can add the fresh basil to your soup. One of my favorite days in Iceland was the day trip from Reykjavik to Vik along Iceland’s south coast. Falling 213 feet (65 meters) over an old sea cliff, Seljalandsfoss is one of the most well-known waterfalls in Iceland and one of the first stops on the journey. The “Eyjafjallajökull Erupts” Visitor Center is another stop I highly recommend, where you can watch a 20-minute video about the 2010 volcanic eruption that cancelled tens of thousands of flights and how it impacted the local people. For short, it’s called E-15, because it’s E + 15 letters! Vik is the largest town for 40 miles in all directions with a bustling population of about 300 people. Sitting right along the Ring Road, it is the most southern town in Iceland. It’s also a good stopping point for lunch. If you didn’t pack a lunch, Sudur Vik is a great option. It’s not cheap (nothing is in Iceland) but a cup of hot soup can make a big difference on a chilly day of driving. From Vik on your return toward Reykjavik, Reynisfjara Beach is especially impressive because the sand is black and the beach is home to basalt columns of Reynisfjall mountain, which are like an otherworldly experience. These rock formations are completely natural and the massive basalt cave has been continuously carved and shaped by the sea. Finally, don’t miss Dyrholaey, where you’ll get the best view of the natural arch from the lighthouse at the top. If you have a nice day, you may even be able to view some puffins from here. Do I think the Blue Lagoon is overrated? Yes. Would I have skipped my visit if I had the chance to go back in time? No way. In my opinion, the Blue Lagoon is a place you should go at least once. I’m not in any hurry to return as it is overpriced for the experience and I found it to be too crowded. But it was unlike anything I’ve ever experienced before. The water is loaded with minerals like silica and sulfur, which is why the Blue Lagoon is known for being good for the skin. Water temperatures average 98–104°F (37–40°C). Make sure to pre-book as time slots can fill up quickly. They tend to be the busiest from 10am to 2pm, so arriving later in the afternoon or in the evening is the best time to avoid the crowds. The Blue Lagoon is about a 45-minute drive from Reykjavik, but it’s on the way to the airport so you may wish to add this into your visit on your way to or from the airport. I hope to return someday and do the entire Ring Road drive all the way around the coast of Iceland. But for a few days on an Iceland stopover, we opted for the short day trips instead. They still proved to be just as magical! Until next time, Iceland.